Should You Have a Case Study? Case studies are rock star pieces to include in your suite of content marketing tools. They make you look good by giving tangible examples of how you perform. More importantly, the content is driven by what your customer says about you – and that packs massive credibility. That said, not everybody needs a case study. People buy all kinds of things in all kinds of ways. To know what kinds of marketing pieces you need, it’s helpful to look at what type of buying is being done and how you’ll interact with prospects in each phase of the buying cycle. Buying insurance is way more complex than buying a loaf of bread. Yet, depending on the type of insurance, customers may treat it more like a habitual buy than a complex buy. For example, purchasing car insurance often doesn’t involve a lot of thought – at least not as much as selecting the right group health insurance plan. So, the first case study “need” test comes down to purchase complexity. If you’re selling a product that costs a lot and requires some thinking, you probably should have some insurance case studies in your arsenal. How should you use them? Case studies are “bottom of funnel” (BOFU) offers. They are impactful when used toward the end of the buying cycle. Once prospective clients believe in your promise and value propositions, they want to verify that you do what you say you do. That’s when testimonials and case studies work magically. They erase any remaining doubt and give prospects confidence to proceed. The second and final case study “need” test relates to your closing effectiveness. How often are you losing clients in the final stage of the buying process? Do you already have effective “proof” elements in your marketing materials, or would it help to bolster your close? So, to sum it up: If you sell a product or service with a longer buying cycle or a complex buying decision, or if you need a strong piece to seal the close, case studies are a great tool to consider. 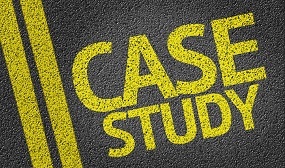 Learn more about how to write a case study. © 2018 Inbound Insurance Marketing. Part of INfusion Marketing Communications, Inc. All Rights Reserved.